He’s a motherfuckin’ Starboy and his first visit to Perth last Thursday confirmed as much. The Weeknd, known on his passport as Abel Tesfaye, had the moves, voice and show to prove he’s the real deal. Unfortunately he also brought a posse of Starboy-loving sycophants along to bore us for the first two hours. The less said about French Montana and NAV the better. 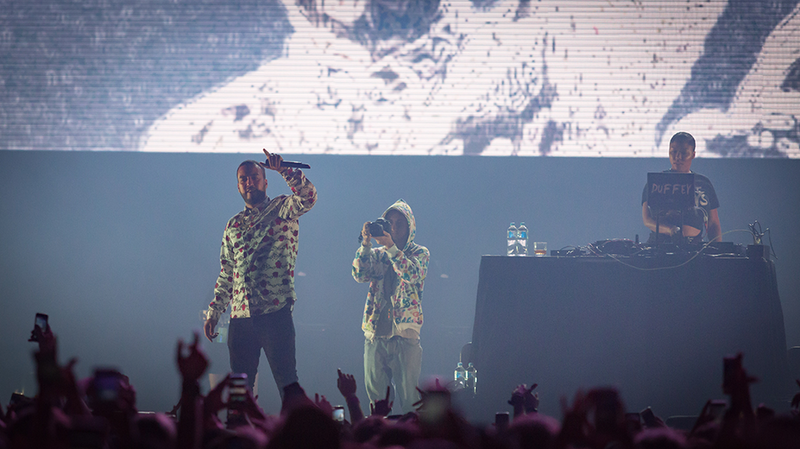 The former – the night’s big name support – mercifully finished early, but not before attempting every live cliche in an attempt to hide the fact that his tracks, likewise, exhibit every hip hop and R&B cliche available. You couldn’t blame The Weeknd for dumbing down the production – all supports had the great use of visuals, lights and sounds – but you could blame him for his choice of acts. At least the warm up DJ between Montana and Tesfaye played some bangers worth shouting along too. Obvious perhaps, but sped up versions of Kendrick’s Humble and Jay Z & Kanye’s Niggas in Paris were fun at least. 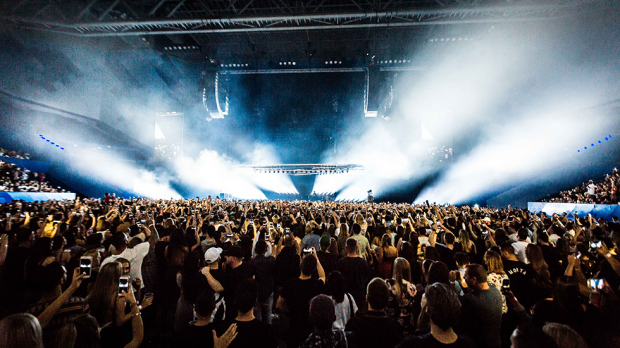 While the young crowd didn’t seem to mind too much, when The Weeknd finally hit the stage at 9.50pm it was nothing short of a revelation after what came before. 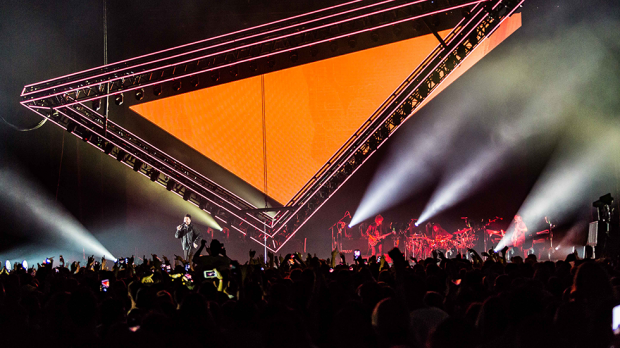 The stage’s showstopping set-piece, a lighting rig-sized triangle of visuals and lights descended from the roof to the stage as part of a grand entrance, before Tesfaye burst straight into signature hit Starboy from the last year’s album of the same name. Straight away it was a wow moment, and while second track Party Monster didn’t quite maintain momentum, ‘the triangle’ had us transfixed as it rose back up around half way to the roof. 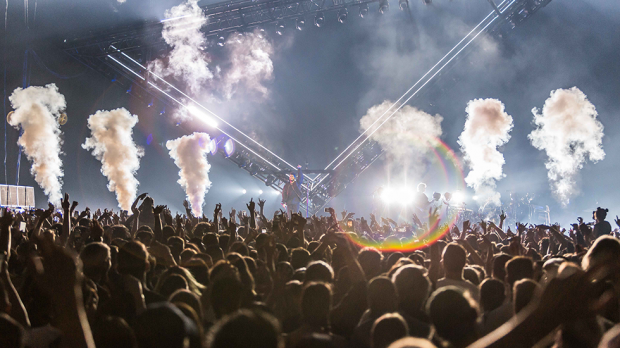 It was the sort of set-piece we’ve come to expect from Muse’s dazzling concerts. The three-piece live band consisting drums, bass and guitar/ keys, were packed tightly into one corner and occasionally overwhelmed by a pre-recorded backing track, leaving no doubt as to who the Starboy was. 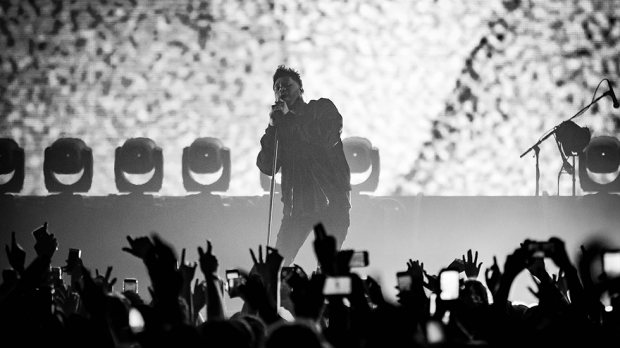 And Tesfaye, for his part, owned the stage. Now sans dreadlocks, he danced with wilful abandon and sang like a future incarnation of his idol, Michael Jackson. Alas there were no covers of Dirty Diana on this night as the first half favoured lesser known cuts and collaborations with the likes of Future, Belly, Drake and Ty Dolla $ign – fine if you’re fans of those acts – plus a guest return to the stage from NAV which was as ill-advised as French Montana returning later for Unforgettable. The latter nearly derailed the show at its peak. But when Tesfaye played his own hits he had the crowd in the palm of his hand. Nine tracks in Often was a winner, as was Acquainted which followed. A welcome segue into two tracks from his groundbreaking – and still best – release, 2011 ‘mixtape’ House of Balloons, saw The Morning and Wicked Games make the night worthwhile for older fans, while younger ones looked around scratching their heads. 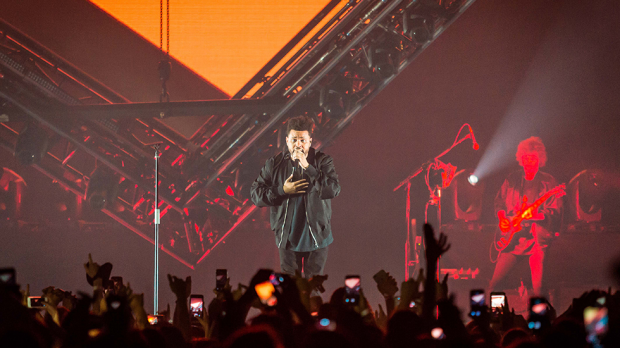 Indeed, The Weeknd straddles an enviable place as alt-R&B trendsetter and major league pop headliner these days, but is was clear from the turnout that most Tesfaye devotees in 2017 are younger fans. The night’s peak arrived with Earned It (50 Shades of Grey) and his best yet Michael Jackson appropriation on In the Night, before the aforementioned French Montana guest spot Unforgettable contradicted its title. Still, 2015 monster hit Can’t Feel My Face had the dancefloor heaving and could’ve been played twice it was so much fun, while Daft Punk collaboration I Feel It Coming ended the set on a high. It’s easy enough to level criticism at Tesfaye for not playing enough of his own tunes (False Alarm, Real Life, Losers and House of Balloons were all amongst the omissions – give or take a snippet of the latter’s intro) or only playing for 80 minutes after making us wait nearly seven years and six albums (if you include the Trilogy mixtapes). The one-song encore of The Hills was as short as it was spectacular, and it had the feel of business as usual. But the opportunity to hear this spectacular voice live in concert and see The Weeknd at the top of his game ensured this a concert that will live on in the memory of fans.